When it comes to skincare many people do not have the information that is needed to put together an effective daily skin care regimen. Don’t worry; as a professional Esthetician, I can help you on your skincare journey. I pride myself in my knowledge when it comes to skincare and I love to share it with people. I will begin by explaining the importance of having a strict Skincare Regimen and what it can do for your skin and your self confidence. The first crucial step in any skincare regimen is cleansing. Most people cleanse their face but often times are not using the right cleanser to fit their skin’s needs. A cleanser should not strip the skin from its protective barrier or leave it feeling tight. If you have sensitive or dry skin you should be using a very gentle or hydrating face wash like Glytone's Mild Cream Cleanser, Avene’s Gentle Milk Cleanser or Vivier’s Hexam Gentle Cleanser. This is also true for mature skin. Normal skin types (skin that does not feel dry or does not get oily), should be using a cleanser that is still hydrating but won’t make your face feel tight. If you have combination, oily or acneic skin you can use a more powerful face wash. For example, if you get really oily or have acne you can use a face wash that contains Salicylic Acid. This is an ingredient that helps combat excess sebum production and helps to prevent acne. These include Glytone’s Acne Clearing Toner with 2% Salicylic Acid and Skin TX Foaming Facial Gel Cleanser. After cleansing the skin it is recommended to exfoliate 2 to 3 times a week. Something you can use is a simple facial scrub. A scrub such as Vivier’s Vitamin C Scrub can help slough off dead skin cells and unclog pores improving texture underneath makeup and diminishing breakouts or black heads. You should not use a scrub everyday as it can dry out the skin or even cause more breakouts due to the exposure of bacteria. Toning is an extra step a person can add to their skincare regimen. It is done after step #1 cleansing. Toning helps balance the PH in your skin. Although not a lot of people do this step, it can actually make a dramatic difference in your skin. Having a neutral balance can help keep blemishes away. There are different types of toners, from really gentle to really strong. I would try to stay away from toners that contain a high dose of alcohol because it can dehydrate the skin. A good toner that contains Witch Hazel is good because it is hydrating, helps tighten pores and it is anti inflammatory so it helps soothe blemishes. Popular brands we carry are Glytones Acne Clearing Toner and Vivier’s Refreshing Toner. Toning skin before a skincare regimen can help soften the top skin layer so products can penetrate deeper into the skin. You can enhance your skin care routine by adding a treatment step. Products can range from serums, to acne treatments or anti aging products. Serums are usually thinner and lighter than moisturizers and they're packed with high concentrations of active ingredients. Serums pair nicely with your moisturizer and eye cream, and can treat every skin-care grievance imaginable (dryness, spots, wrinkles) Serums can be chock-full of moisturizing ingredients (hyaluronic acid, and ceramides) to help skin retain moisture, but that doesn't make them moisturizers in the traditional sense. Face lotions and creams are richer and create a barrier on top of the skin to keep all that good stuff in. Some serums contain Vitamins such as Vivier’sVitamin C Serum with 2% hydroquinone that help brighten the skin, or Vivier's Serum 20 which helps hydrate, reduce damage and aid in anti aging. A great anti aging serum may contain peptides as well like Vivier's C and E Peptide. If you are acne prone or get occasional breakouts you can apply your acne treatment during this step. Examples of acne treatments are Benzyl Peroxide which kills bacteria causing acne and it works within a few days. Another acne treatment is Salicylic Acid such as Glytone’s Acne treatment lotion which helps to gently exfoliate dead skin and speed up the recovery of blemishes. A great anti aging treatment you can do at night is using any form of Retinol to diminish fine lines or help to prevent them. Avene’s Retrinal Day Emulsion or Vivier’s Retinol SR Complex 0.3% or 1.0%. Another treatment you can add to your skincare routine is an eye cream. Some eye creams work by helping to hydrate the thin skin around the eyes such as Vivier’s Radiant Eye Contour Cream. There are eye creams for fine lines, dark circles and even eye creams that contain retinol to combat signs of aging such as Avene’s Retrinal Eyes or Vivier’s Dark Circle Eye Cream. The smaller molecules in eye creams work to penetrate and absorb into the thinner skin around the eye area. Using a hydrating eye cream during early stages of life can help prevent wrinkles in the future. As our eyes are always moving to look around, open and close, so having that extra hydration really helps lines from forming. After applying a treatment and letting your skin soak it in you can now moisturize. You can determine what moisturizer to use depending on your skin type. If you have dry skin you can use a thicker or more emollient moisturizer such as Vivier’s Ultra Hydrating Mask with Shea Butter or Vivier’s Nightly Age-Defying Moisturizer. If you are sensitive you can use a moisturizer that has calming ingredients such as Vivier’s Lexxel. Normal to combination skin can use a light weight moisturizer. Oily skin would benefit from more of a water based moisturizer such as Vivier’s Daily Age Defying Moisturizer. Oily skin should never skip this step because it helps balance the oil production. In fact sometimes if a person that has oily skin does not use a moisturizer it can cause more sebum production due to lack of moisture on the skin. The last step, and most important in my opinion, in any skincare routine is sun protection during the day. The sun can really damage our skin if we do not protect it against the UVA and UVB rays. It is actually one of the reasons why people get hyper pigmentation and wrinkles later on in life. A good daily sun protection like Elta MD Broad Spectrum SPF 46 in clear and tinted options are a great SPF of 30 or above. If you will have a higher exposure such as a beach vacation, your sunscreen should be at least a SPF of 45 or higher such as Elta MD UV Aero Broad Spectrum full body sunscreen. Remember to reapply after 80 minutes of swimming or sweating and at least every 2 hours. 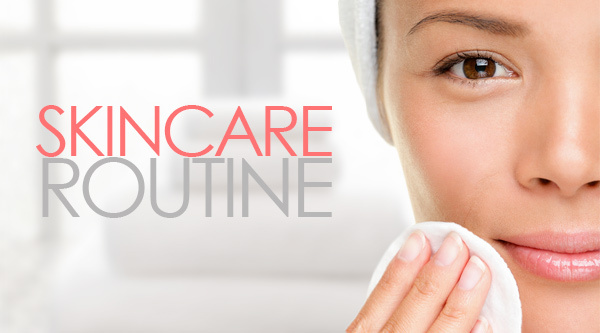 Aside from a skincare regimen you should also schedule professional skin care treatments at least quarterly. These treatments will help you achieve even better results. A facial at least once a month is recommended. A facial can help do a deep exfoliation of the skin. Here at Renue we provide a Customized Facial according to your skin care needs. Examples of exfoliation are enzyme masks, micro-dermabrasion, which uses a diamond tip to slough off dead skin, or derma-planing which uses a sterile surgical blade to remove dead skin and peach fuzz. These treatments leave the skin smooth and exfoliated, allowing your skincare products to penetrate deeper. Exfoliating is crucial in a skin care routine as build up of dead skin cells on top of your skin can cause clogged pores leading to break-outs or texture problems. A facial can also help with acneic skin as the esthetician performs extractions to purge out sebum, masks to open pores and medical devices such as high frequency device to kill bacteria. A hydration facial is great and relaxing for someone that has dry skin or even flaky dry skin as this can help increase hydration and help get rid of those flakes. Other great treatments you can do are chemical peels. Peels can help combat many things such as fine lines and wrinkles, hyper pigmentation, acne and redness. You may need a series of treatments to obtain desired results. Another great treatment is microneedling. Microneedling is a device that has a tip containing 12 tiny needles. The device vibrates on top of the skin as the Esthetician glides it across; causing small injuries on the skin causing the skin to then regenerates itself. Using plasma with this treatment helps aid in the recovery and assists in healing to form collagen. It can help to improve the appearance of acne scars, fine lines and sunspots. A series of 3 or more sessions is recommended. Overall having a good daily skincare regimen and adding treatments every 1 to 3 months can help improve the appearance of your skin. After committing to a skincare regimen it may take 4-6 weeks to obtain the desired results. The skin’s cells take a few weeks to regenerate themselves. In the end the result are worth it and the time and effort put into it will show. A once dull complexion can begin to glow. Blotchy hyper-pigmented skin can become clearer. Acne break-out can settle down.